This course’s main purpose is to impart basic knowledge in understanding the principles and practice of Diagnostic and Screening testing, specifically to assess the reliability and validity of those tests. In general, “tests” may involve medical imaging, blood or biopsy analysis, clinical judgement, or other methods of measurement. Apart from imparting knowledge on the test accuracy, we will also focus on situations where a reference “gold standard” test may not be available, or where the reference test is imperfect. Also, there may be some situations where the gold standard test is done only on patients who are test positive, particularly when the gold standard test is an invasive procedure, or if it is unethical or expensive to administer. Other topics that may be covered include: analysis of agreement between tests; Diagnostic test evaluation in meta-analysis; and the problem of correlated test errors. An important aspect of this course will be hands on exercises using examples to understand the theory and its application in Diagnostic research. A free source LEM software will be used to do the practical. Correctly interpret diagnostic test accuracy (sensitivity, specificity, likelihood ratios, ROCs, accuracy) using different data sources with Diagnostic Test Software (Dx Test). To evaluate test accuracy when there is no gold standard or with an imperfect gold standard, with a focus on using Latent Class Models. To understand, estimate and interpret Diagnostic Test Meta Analyses, using the Summary ROC curve estimated through Latent Class Models. Recognize when verification bias (work-up bias) is a threat to study validity and calculate the magnitude of error from such bias. Dependence of diagnostic accuracy on disease prevalence and departure from assumptions due to correlated observations. 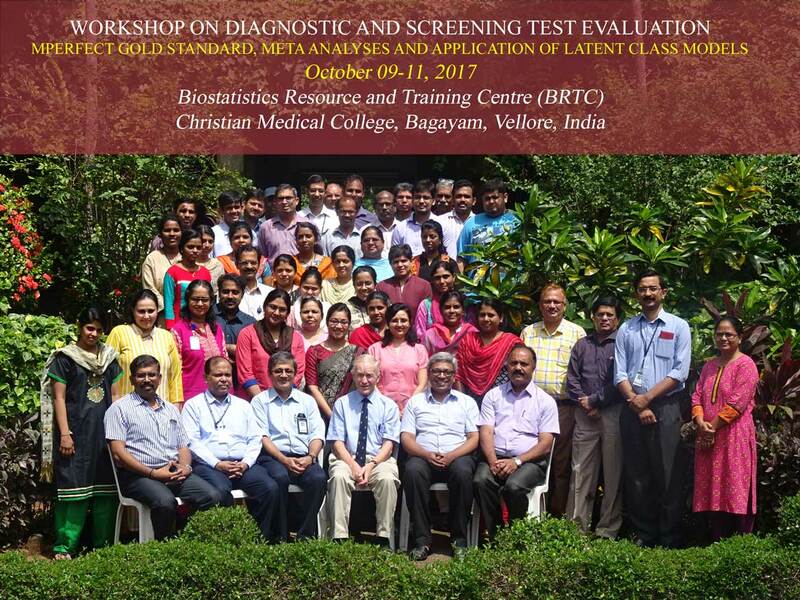 This course is tailored to medical, allied health professionals, nonmedical faculty, and/or researchers who are interested in learning more about diagnostic test research (validity and reliability studies), or teaching institution members interested in furthering their knowledge and skills in methodology. Course Fee should be paid in full by September 30, 2017. • Basics of diagnostics test, serial and parallel test. • Cost implications highly sensitivity and specificity test. • Bias due to imperfect Gold standard. -- Estimation of sensitivity and Specificity without Gold standard. -- Estimation of sensitivity and Specificity with imperfect Gold Standard. -- LCM computation using the EM algorithm. -- SROC method: AUC and partial AUC summarisation. • All lectures will be followed by practical using Dx Test and LEM Software.